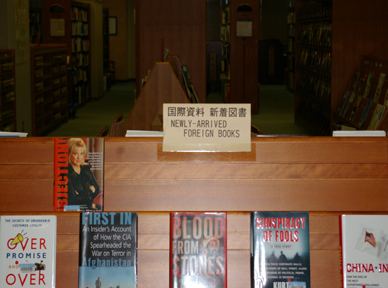 Located just as you enter the library entrance, this section is where newly purchased library material are displayed. The Newly Arrived Book section quickly exhibits popular and much talked about new publications that can be checked out on the spot. Books and library material are put on exhibit every week. 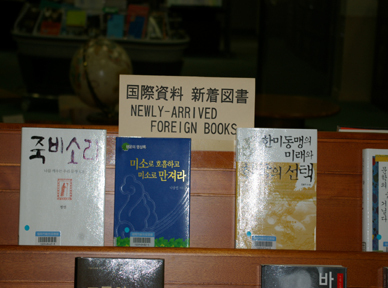 Although this section only exhibits Japanese books, there is a small new arrival section for foreign books set up by Reference Counter-3 (International Materials Counter) on the second floor (pictures above are from the 2nd Floor newly arrived foreign books section).